Happy 2017! While we’re gearing up for the current tax season, it’s important to plan ahead for next year as well. Below are some of the key changes to IRS rates and limits for this tax year. Please note these apply to the 2017 tax year, which you file your return for in 2018. 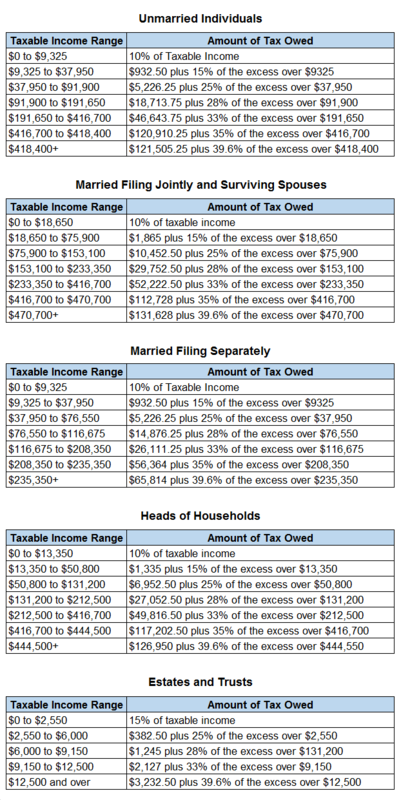 Without a doubt the most important item, here are the tax rates and income brackets for 2017. The rates (percentages) remain the same as they were in 2016, but the income brackets have been adjusted for inflation. The IRS deduction limits have also been adjusted. The standard deduction amount for single filers and married filing separately is $6,350, up $50 from 2016. For married filing jointly taxpayers, the amount is $12,700. For heads of households, the amount is $9,350. For 2017, 401K and IRA contribution limits remain unchanged from 2016. You can contribute up to $18,000 to employer sponsored plans such as 401K, 403B, and 457 plans, as well as the US Government Thrift Savings Plan. For IRAs, limit remains at at $5,500 and the catch-up contribution for individuals aged 50 and over remains at $1,000. What has changed, are the phase out ranges for IRAs. There are two IRA phase out ranges, one for Traditional IRAs and one for Roth IRAs. For Traditional IRAs, the phase out ranges which determine your ability to deduct traditional IRA contributions on your tax return. If you are in the income range for your taxpayer status, your deduction is reduced proportionately until you are over the range at which time it is completely eliminated, or “phased out.” The 2017 ranges increased by $1,000. For single filers, the deduction begins to get phased out at an adjusted gross income of $62,000 and is eliminated at $72,000. For married filers, the phase out starts at $99,000 and the deduction is eliminated at $119,000. For Roth IRAs, the phase out ranges determine whether you are eligible contribute to a Roth IRA or not. If you are within the range for your status, the amount you can contribute to a Roth IRA is reduced from the full $5,500. If you are above the range, you won’t be able to contribute to a Roth IRA at all. For 2017, the Roth phase out ranges increased by $1,000 for single filers and increased by $2,000 for married filers. For single filers, the phase out now begins with an adjusted gross income of $118,000 and ineligibility is at $133,000. For married filers, the phase out begins at $186,000 and ineligibility is at $196,000. Keep in mind that there are no income restrictions on converting a traditional IRA to a Roth IRA. So even if you are above the phase out range for a Roth IRA, you can contribute to a traditional IRA and convert it to Roth later on. You will just have to pay taxes on the contributions at your ordinary rate. The Child and Dependent Care Credit is a credit that you can claim if you need to pay for the care of a child or dependent to allow you to work. The claim amounts remain the same for 2017. You can claim up to $3,000 worth of expenses for the care of one child or dependent and up to $6,000 for the care of two or more. The actual amount of the credit is a percentage of the claim amount. The percentage ranges from 35% to 20% depending on your income. To get the full 35%, you need to have extremely low income (below $15,000). Most people will only be able to claim 20% which comes out to a $600 credit if you had full claim of $3,000 for one child and $1,000 if you a full claim of $5,000 for two or more children. It is important to note you cannot claim any amounts that were covered through an FSA account or other employee benefits. For example, if you had $6,000 in expenses and $5,000 was paid through an FSA account, you would only be eligible to claim the remaining $1,000 and your actual credit would be 20-35% of the $1,000. The Child Tax Credit is a credit that you can claim simply for having a dependent child under the the age of 17 that lives with you at home. There are a few other criteria that must be considers as well for example, the child must be a US Citizen. For 2017, the Child Tax Credit remains at $1,000 per child with income phase outs at $75,000 for single filers, $1110,000 for married filing jointly, and $55,000 for married filing separately. The credit is reduced $50 for every $1,000 you are over the phase-out amount. If you have student loan interest as reported by a 1098-E, the maximum deduction you can claim remains at $2,500. The phase out range which reduces this, however has increased by $5,000 for taxpayers with a married filing jointly status. For married filing jointly returns, the phase out now begins at $135,000 MAGI and the deduction is completely eliminated at $165,000. For single filers the range remains the same as 2016, starting $60,000 MAGI and completely phasing out at $80,000. These are just a few of the key changes to common deductions and credits. You can find more details on changes for 2017 in IRS Revenue Procedure 2016-55. If you have any questions about any of the credits and deductions mentioned here, contact us for a consultation.